Weight is the biggest struggle of young kids these days perhaps because of the food they eat and the lifestyle they lead. Parents today are almost always harassed and exhausted so you can’t expect them to prepare healthy home-cooked meals when more often than not, both partners are out most of the day earning their keep. Aside from feeding their young children sweets, junks and processed food, kids also have access to tech gadgets to help them pass the time and not bother their tired parents at home. So eating + lounging around with a tablet/smart gadget with WiFi in hand = obesity. Hence, more and more kids are diagnosed as overweight and obese today than kids in the past. Childhood obesity is hardly peculiar to Japan. The researchers see “Japan follow[ing] the global trends,” with “the prevalence of childhood overweight and obesity increas[ing worldwide] in the late 20th century,” pushing the number of preschool children who were overweight or obese in 2014 to approximately 41 million. Even adults find comfort in eating especially when they are stressed. It is not surprising to discover that kids are vulnerable to this too since it helps them cope with all the new things they encounter in life. Children’s preoccupation with technology leaves them too lazy to engage in more active outdoor activities that young kids their age should be doing. Yet even though we like pinching the chubby cheeks of a cute, fat child, the impact of obesity on the health and well-being of that child is not always a positive experience as it can put them at higher risk of certain medical conditions and even suffer from lower self-esteem from being bullied by their peers for their heavy weight. Society as a whole should be taught to change their perception regarding obesity and basically urge everyone to examine the way they live their lives and how parents also raise their children. If children aren’t taught about the value of health and healthy eating, they will carry their bad habits into adulthood and eventually do the same thing to their children. It will be an endless vicious cycle that we are starting to feel its menace now. The problem basically lies with the types of food we eat and how we live our lives when we are constantly glued to the screens of our smart gadgets day in and day out. 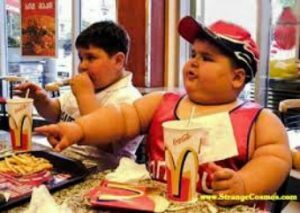 Despite this awareness, nothing much has changed and kids still get fed with fastfood and all things sweet and processed. But you can’t blame most parents since it is actually more expensive now to feed your family with healthy and organic food than junks especially if these parents are also struggling to make both ends meet. Indeed, it takes a village to raise a child. It is only with the concerted efforts of everyone that we can start making progress in addressing childhood obesity and saving young kids from a long list of health, emotional, and mental woes brought about by being overweight or obese from a young age. Euro Toques Create a free website or blog at WordPress.com.